Massage tables can mostly be broken down into three quality levels. Budget, where the quality is quite poor. 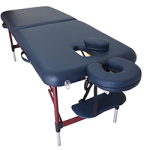 Entry level, which can often be good value for money and many therapists get by fine with this type and finally Professional Grade, where the massage table has the highest quality components and build quality and you are able to offer your client the most comfortable and luxurious experience. All the other massage tables I have reviewed have been high entry level or Professional Grade except for this one. I normally would never buy an entry level table myself. It is kind of a false economy also because the price difference is usually only the cost of you doing 2-3 treatments so it’s over the course it really doesn’t cost you that much extra and probably ends up increasing your client return rate. That being said, I know some students or other therapists reading this site may not be able to afford a professional grade massage table so I have decided to review what I believe to be a very good value for money entry level, lightweight massage table. If you are on a budget please don’t buy a cheap budget table on ebay or amazon as you will actually end up paying more when you buy another one not so long after. The BodyPro Traveler is priced under £150 depending on where you buy. It is a very lightweight massage table at only 12Kg’s. 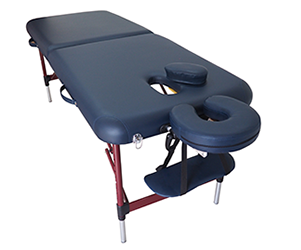 It is a great massage table for a student or beginner who needs a lightweight massage table or maybe for a more experienced therapists who mostly does treatments from one location and has a heavier bed and needs a second lightweight bed for a couple of mobile treatments every week. One of the students at my night class bought one and brought it in to show other students in the class. I tried it out and it is surprisingly very stable for a table at this price level. The foam is thick and comfortable enough and it has two breathe hole options, which I always recommend. Looks really shouldn’t matter and the form and function should be why you choose your massage table but my favourite thing about this particular massage table is it’s looks. It has lovely burgundy coloured aluminium legs and frame that nicely compliments the colours of the leather. The horse shoe shaped face cushion is typical of this price level and is not as comfortable as the professional grade tables on the market. It is also not as ergonomically shaped like the fully professional ones are. All in all though, it’s a recommend from me! Have any questions or maybe you’ve bought this massage table yourself and can give your own feedback – leave your comments below!